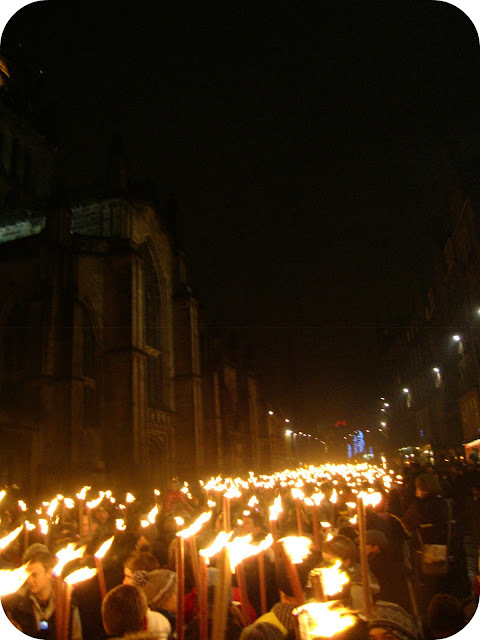 Last night, David and I participated in the Torchlight Procession which opens the annual Edinburgh's Hogmanay (New Year's Eve) celebrations. 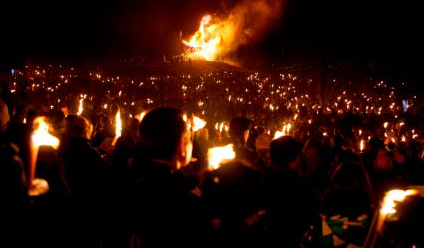 A bunch of people dressed as vikings alongside Scottish highlanders dragging a viking warship (which is later burnt), led what they are saying was a 15,000+ strong crowd all carrying flaming torches through the city of Edinburgh. It started at the historic High Street (Royal Mile) and wound through Princes Street and up to the ancient Edinburgh meeting ground Calton Hill. It was amazing to see so many lights! It may not be widely known but Christmas was not celebrated as a festival and virtually banned in Scotland for around 400 years, from the end of the 17th century to the 1950s. The reason for this has its roots in the Protestant Reformation when the Kirk portrayed Christmas as a Popish or Catholic feast and therefore had to be banned. Many Scots had to work over Christmas and their winter solstice holiday was therefore at New Year when family and friends gathered for a party and exchange presents, especially for the children, which came to be called hogmanay. There are traditions before midnight such as cleaning the house on 31st December (including taking out the ashes from the fire in the days when coal fires were common). There is also the superstition to clear all your debts before "the bells" at midnight. 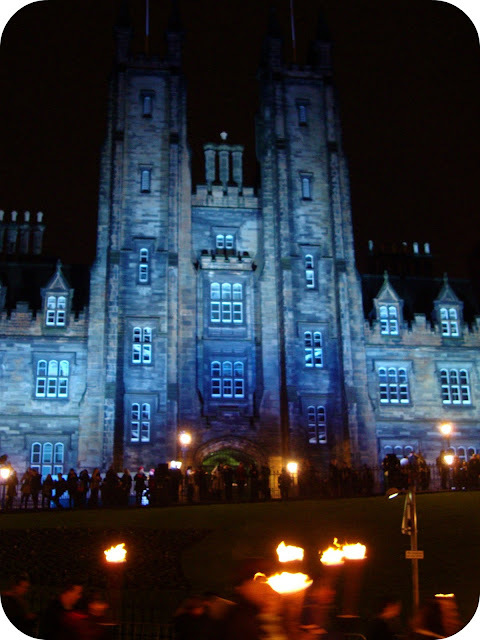 Immediately after midnight it is traditional to sing Robert Burns' "For Auld Lang Syne". Burns claimed it was based on an earlier fragment and certainly the tune was in print over 80 years before he published his version in 1788. An integral part of the Hogmanay partying, which continues very much today, is to welcome friends and strangers, with warm hospitality and of course a kiss to wish everyone a Guid New Year. The underlying belief is to clear out the vestiges of the old year, have a clean break and welcome in a young, New Year on a happy note. Have a Happy New Year everyone! See you in 2012! Looks amazing. Happy new year! These photos are great! Thanks for the history lesson - I've always enjoyed learning about the traditions of other cultures. Looks like you had a great time. Happy New Year and have a wonderful 2012. Wow, looks like fun. It's too bad other places don't have traditions like that. Wow! That looks amazing! I would love to experience that! Have a Happy 2012! How wonderful! Happy New Year to you and David! fantastic, wish I were there! I have a Scottish mum and we always celebrated Hogmanay as much as Christmas. I've sadly never been Edinburgh on NYE, it looks amazing!! Happy new Year! What great history! Looks like a lot of fun. Saw the procession on some news program or other -- had no idea you were there! We read that it is an Italian tradition to wear red underwear on New Year's Day. And that some Scots celebrate by "jumping into the new year" off their sofa, at midnight. The one time we tried that, the sofa scooted across the floor under us and we nearly broke our necks. Happy New Year! Thanks for sharing with all of us! What a great festival--looks like you had a great time. Happy New Year! i read this yesterday in a haze, and hallucnated that i commented. this looks AMAZING. 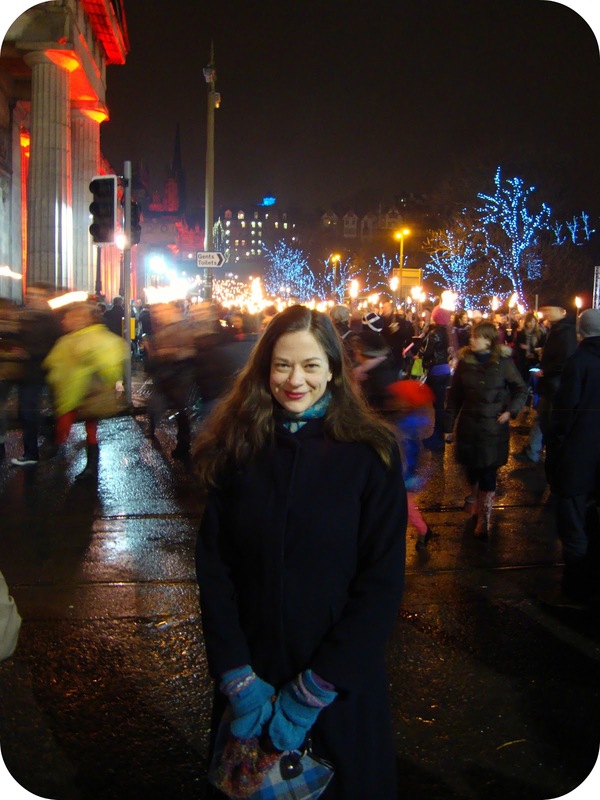 Sad to have missed another Hogmanay! It looks like it was so fun! We went to the 2009 Hogmanay, but have missed the past two. The best New Year Eve I've ever had. The Hogmanay celebrations in Edinburgh are absolutely amazing. There is nothing else like them anywhere around the world. Nice post.All the pics are fantastic.Its really looking awesome. I have just bookmarked this page so I don’t miss any more of these.